Like pumpkin, watermelon and squash; cucumbers belong to the family of Cucurbitaceae. Cucumbers, like watermelons, contains a huge quantity of water, 95% to be precise, as a result of which, consuming cucumbers help to keep the body hydrated during summer. Not only in summer, can cucumbers yield a lot of health benefits throughout the year. It contains an array of different kinds of vital nutrients like Vitamin K, B and C along with Potassium, Calcium, and Manganese. Cucumbers are very helpful when it comes to avoiding nutrient deficiencies. 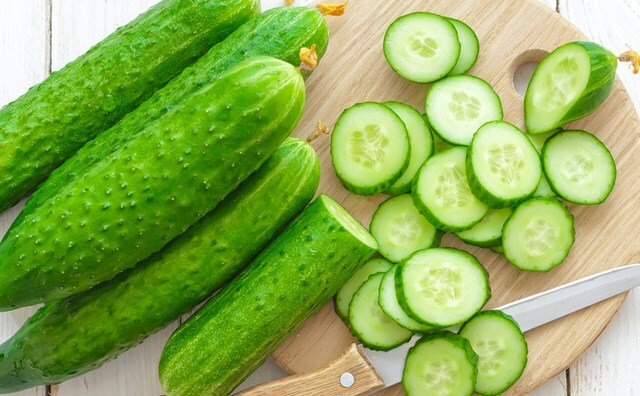 Besides some of the important nutrients, cucumbers also contain different other kinds of compounds along with unique polyphenols and which helps to reduce the chances of getting affected by various kinds of chronic diseases. There are many reasons why cucumbers can be eaten throughout the year. Here are some of the major health benefits of cucumbers. Fisetin, which is an anti-inflammatory flavonol, is present in cucumbers. It plays a very vital role in maintaining the health of the human It is also very effective to protect the vital brain cells and nerves from damage. Fisetin has also proved to be very useful when it comes to preventing progressive memory. Lignans like lariciresinol, pinoresinol and secoisolariciresinol are present in cucumbers. These elements help to lower the risk of uterine, breast, prostate, and ovarian cancer. Cucumbers also contain cucurbitacins, which are phytonutrients. These phytonutrients are also very effective when it come to preventing cancer. Cucumbers have proven to be very helpful when it comes to cooling inflammatory response in the human body. Studies have shown that extracts from cucumbers help to prevent unwanted inflammation. Mouth odor is caused by a special kind of bacteria. Keeping a slice of cucumber in the mouth would help to get rid of the odor and create a refreshing sensation in the mouth. Cucumbers also help to keep the stomach cool which in turn helps to prevent bad breath. Different kinds of antioxidants are present in cucumbers, which include beta-carotene and Vitamin Cucumber also contain apigenin, quercetin, kaempferol, luteolin and other kinds of antioxidant flavonoids. Quercetin is one kind of antioxidant which is very helpful when it comes to preventing histamine release. Kaempferol, on the other hand, helps to reduce the chances of heart ailments and other kinds of chronic diseases. Different types of Vitamin B are present in cucumbers, which include vitamin B5, vitamin B7, and vitamin B1. Vitamin B has proven to be very effective when it comes to releasing stress and to ease the feelings of buffer and anxiety. Fiber and water, two of the most important elements required by the human body are found in abundance in cucumbers. The skins of cucumber contain fibers which are insoluble in nature. These fibers help to clear the digestive system of the body. Apart from these, cucumbers have different other kinds of health benefits like maintaining the body weight, prevents heart diseases and much more. Cucumbers are rated very highly in the Ayurvedic medical practices where it has been stated that cucumbers are very effective for treating skin diseases. Cucumbers are also very helpful for those having cholesterol and high blood pressure.